In the US, community acupuncture emerged out of the northwest, but there’s a growing number of clinics across the south, and we’re proud to be the first in the El Paso/Las Cruces region. Crossroads Acupuncture will celebrate its newly renovated clinic space inside Families and Youth, INC with an Open House, a ribbon cutting ceremony provided by the Green Chamber of Commerce, and a book reading and book signing by Joshua Wheeler. Refreshments will also be provided. Wheeler’s book about Southern New Mexico, Acid West, which was included on Oprah’s Summer Reading List, includes a chapter “A Million Tiny Daggers” that features Crossroads’ work providing acupuncture for underserved communities in the border region. Wheeler will offer a book reading, and also be available to discuss his writing of this book. Wheeler followed Crossroads’ volunteers around for 3 years prior to publishing this new book, which has received praise, in addition to oprah.com, from the Los Angeles Times, The Los Angeles Review of Books, The Santa Fe New Mexican, and Spectrum Culture. Crossroads moved its community acupuncture clinic into Families and Youth, INC (FYI) in 2017. With FYI expanding its current mental health services, Crossroads is renovating its current clinic space within FYI’s main building on Solano to make a permanent home, which will include a direct entrance from the main FYI lobby. Crossroads is a proud member of the Green Chamber of Commerce and remains committed to the Green Chamber’s Triple Bottom Line: People, Planet and Profit. Crossroads has been offering affordable acupuncture care in Las Cruces since 2012, and maintained a downtown clinic location off of the farmer’s market for several years before moving into the FYI building. In addition to their community acupuncture clinic at FYI, they have established a network of free ear acupuncture clinics throughout the border region. In addition, they support a project assisting people affected by violence in Juarez, Mexico, known as Flores de Juarez. Crossroads’ mission is to make healthcare accessible and affordable to people of all income levels through the support of local communities. Crossroads does do this through providing low-cost services, training health providers in cost-effective techniques, and helping underserved groups establish and sustain their own community supported health projects. Invite your colleagues and stay tuned for upcoming details on our facebook page. Fulfills didactic educational requirements for therapists/nurses/health/harm reduction workers to become Nationally Certified as Acupuncture Detoxification Specialists (NADA) as well as state certification in New Mexico, Colorado, Texas, Arizona, and 22 other US states (email crossroadsacu@gmail.com for a complete list of states that allow this certification for non-acupuncturists. Students will learn application both in behavioral health/addictions/harm reduction as well as for trauma/humanitarian aid/disaster response. NADA Ear Acupuncture or Acudetox can help reduce cravings, insomnia, drug dreams, anxiety and depression during addictions withdrawal, as part of prevention for at risk groups, and can be used to help prevent relapse. Acudetox is extremely cost-effective and safe and has no medication interactions or adverse side-effectives. It is applied internationally within psychiatric care, as well as humanitarian aid/disaster relief. This training will prepare students to practice in all types of settings. How does it work? This style of acupuncture is known to activate the vagus nerve. It also stimulates the release of endorphins, the body’s natural opiates, and helps regulate seratonin and dopamine, the brain chemicals involved with addiction. It provides deep relaxation and helps restore internal harmony, which supports the patient in their own process of recovery. Research supports the use of Acudetox to improve retention rates, reduce program costs and reduce recidivism. Crossroads Acupuncture, a 501-c-3 organization has trained over a 250 providers in Acudetox since 2011, and has helped communities in the border region provide over 80,000 treatments primarily within underserved areas. This course contributes to the qualifications necessary to use this technique to treat addictions in the US. After training, we support students up until certification, including an optional portion of the 40 hour supervised internship within programs serving the homeless, low-income/marginalized communities as well as addictions and refugee care in the border region. Crossroads will teach you how to set up and sustain an acudetox clinic within a public health setting is also included as part of the cost of the training. The cost also covers training materials, a training manual, and access to our online acudetox library See registration form for more details. Click here to learn about Crossroads’ NADA Registered Trainer, Ryan Bemis. Crossroads Acupuncture has long been committed to making healthcare affordable for veterans, with hundreds of soldiers who have benefitted from our Veteran’s Care Program. We now are offering a few new programs available for military veterans to receive free care. Call us at 575-312-6569 to learn more! Here are some of the common things that veterans come to Crossroads for care. Acupuncture is recognized by the Department of Veterans Affairs and Dept of Defense as Evidence Based Medicine for PTSD. But does acupuncture really work? At Crossroads, our acupuncturist, Ryan Bemis, has many years of experience serving veterans and soldiers, including working with soldiers with PTSD and combat injuries/pain management at William Beaumont Army Medical Center. Our clinic in Las Cruces has made it possible for veteran’s to receive regular care outside of the VA system. Check out our new location on 1320 S. Solano! Due to an emergency, we will have to move our clinic this weekend, and we will re-open at a new location next week, at the corner of Solano and Idaho. All services will continue at our University location through Friday 2/24. More Parking, More convenient location! 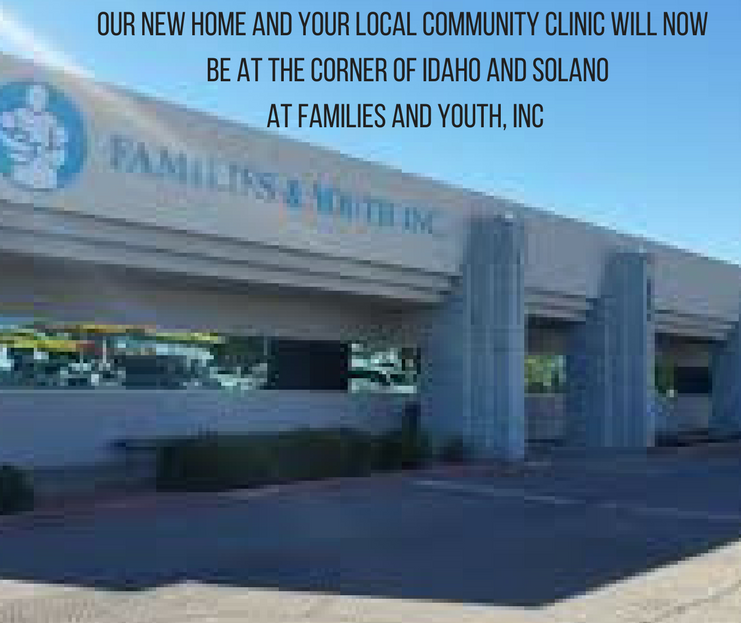 We’ll be moving our clinic to a much more central location in the city, within the health center Families and Youth, INC. There will be lots more parking than our current location on University has allowed for you as patients. We know we know! Parking was bad at University. It will be much better at this new spot in town, right next to Hayden’s Hardware and across the street from Water King. Look for the sign “Families and Youth, INC” and we will have our sign up right there! We believe that our new clinic location, within Families and Youth, INC (FYI) will allow our care to be more accessible to those who need acupuncture the most. FYI is a regional leader in providing services for people in need,and we are grateful that they have given us a home within their home! When you enter our space at FYI there will be a large waiting area serving other programs as well. Just let the receptionist know you are here for acupuncture, and they will check you in, and let me know you are here, after which I’ll come walk you back to our beautiful new treatment space. If you get lost call 575-522-4004. Crossroads Community Supported Healthcare is seeking a full-time office manager for our non-profit organization. The office manager will manage receptionists, billing operations, patient care and ensure the clinic is operating efficiently. The office manager will also assist with our health promotion capacity building program, and our addictions training program in the border region. Applicants with Bilingual English/Spanish, with extensive administrative experience working in medical offices and behavioral healthcare are encouraged to apply. To apply: Email a cover letter and resume to crossroadsacu@gmail.com. Without a cover letter outlining your experience attached to your resume you will not be considered. Experience that will be considered an asset.